Isometrics for Tendon Pain - Is the Hype Justified? Welcome! A quick mention to check out dates for all the Mastering Lower Limb Tendinopathy Courses 2017. And places are filling fast for Erik Meira’s fabulous Hip and Knee course in Melbourne in August. This week we tackle the conundrum of isometric exercise for tendinopathy. This includes a sneak peak, or at least mention of an unpublished paper we are about to submit. This foray into isometrics is sparked by the recent study by Dimitris Stasinopoulos, a prolific tendinopathy researcher from Greece who works in Cyprus. A lovely guy too. I had the pleasure of visiting him in Cyprus a couple years ago. Hopefully you will come away with a better understanding of isometrics and how they can be used. Background: Stasinopoulos and his group have conducted a randomized controlled trial investigating exercise interventions for tennis elbow or lateral elbow tendinopathy (LET). Most people would agree exercise is useful in treating tendinopathy. The best exercise methods are debated and there is not great evidence suggesting we should be doing it one way and not another (e.g. eccentric vs concentric-eccentric). Recently, there is lots of buzz about isometric exercise for treating tendon pain. Stasinopoulos and his coworkers argue that LET is related to forceful grip activities requiring isometric contraction of the wrist flexors and extensors, so using isometrics in rehab makes sense. They evaluated the effect of eccentric versus eccentric-concentric versus eccentric-concentric + isometrics in managing LET. What they did: LET diagnosis was based on localized pain and pain with resisted or stretching tests, and they excluded people with neck referral, arthritis, neurological signs, and prior surgery. Patients were asked to modified activities such as gripping tasks if provocative. They randomized people with LET into the three exercise groups. All groups performed 3x15 and continued even if they had mild pain (defined <4/10). Load was increased with free weights when patients could perform the exercise without any discomfort. The groups performed slow (counting to 30 for a repetition) eccentric isolated (group A), eccentric-concentric (Groups B and C). The only difference between group B and C was the addition of a 45 second hold in between each of the 15 repetitions of the concentric-eccentric exercise. Wow, lot’s of loading! All groups also performed static stretching at the beginning and end of each session. 34 patients were randomized into eccentric (11), concentric-eccentric (12), and concentric-eccentric+isometric (11) groups. 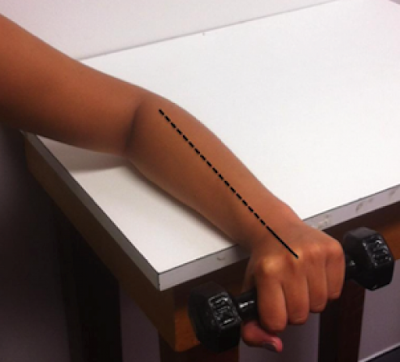 The outcomes were VAS pain and function as well as grip strength at baseline, 4 and 8 weeks. They minimized positive feedback/interaction between the therapist and patient but outcome assessors were not blind to the group allocation. What they found: The headline finding was the concentric-eccentric + isometric group was the clear winner. All outcomes (vas pain, function and grip strength) improved more for this group at both 4 and 8 weeks. Clinical interpretation: Let’s consider a few questions in relation to this finding. 1. Do we believe the findings? I would say yes, as the trial is well conducted. People were randomized into groups. The numbers could have been larger and blinded outcome assessment would have helped to increase our confidence. As well as longer follow-up times – that is probably the main weakness. 2. Is this a clinically important finding? It is important to note that there were improvements in all groups, and the greater improvement in the eccentric-concentric+isometric group was modest – eg extra 1 point on VAS for pain on average. So we could have a debate about the clinical significance of that. This is why longer follow up times may have been helpful. 3. Why did the isometric group improve more? One potential answer is bias of the outcome assessors, but this is covered in point 1 above. Let’s assume there was a real effect, then we can ask, why? Is it because the isometrics was added and this is magically much better than the other interventions. Possibly, but a big factor may have simply been that they did more. Ie the dosage and in particular time under tension was far greater in this group. So we are unable to make firm conclusions about the contraction type. One more question to complete this blog off. Where are we at then with the current evidence supporting isometric exercise for tendinopathy? Here are some slides that cover and include some key clinical messages. POINT 3 = in tennis elbow there was no change in grip pain, but an INCREASE in reported resting pain post isometrics BUT ONLY for the group that exercises into pain (supra-threshold). Note that there were differences in the isometric protocol used compared with previous studies. POINT 6 = We need to understand the mechanisms by which isometrics influence pain. For example, Coombes found kinesiophobia or fear of movement strongly predicted pain with loading. POINT 7 = Further to this, Vaegter found that exercise induced hyperalgesia was impaired in people with lower pressure pain thresholds (the high pain sensitivity group). POINT 8 = probably the best thing to do is experiment with load (regardless of contraction type) and find the ‘entry point’ to achieve a positive response from an individual. Some patients need a softly softly approach, others you can escalate load sharply, others need lots of reassurance/education. Be prepared to play and try things! For example, some of my patellar tendon patients may spend 15-20 minutes gently developing load intensity to allow a positive response from load.